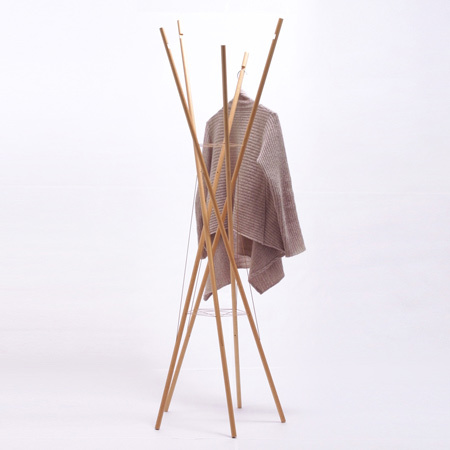 Tokyo studio Naruse Inokuma Architects have designed a coat stand made of five wooden poles held together with string. The sticks are held in a tensegrity structure so that none of the sticks touch each other. The stand was on show at Tokyo Designers Week in Japan earlier this month. See all out stories about Tokyo 09 in our special category. This is the prototype of coat hanger which we exhibited in Tokyo Designer's Week. As it is called clothes tree, coat hanger tends to become tree-shaped. But this work is composed of only five wooden sticks. Using tensegrity structure, whole shape maintains only with balance of tension of strings though the five sticks won't touch each other. This is ultimately simple coat hanger geometry and dynamics generate.